Safari’s highly realistic PVC bamboo is hand painted and even has raised nodes just like our natural bamboo. It is a perfect substitute that can be submerged, used to sleeve steel or concrete columns or electrical conduit, or used in other climates or spaces that are unfriendly to the real thing. Additionally, it will not crack as it ages, and it is treated with a UV-stabilized automotive paints and clear top-coats, making it resistant to weathering affects – beautiful golden bamboo (custom colors available) year after year with no maintenance.! Appearance: Typical ‘stocked’ Duracane is either a natural blond/beige or vibrant green overall. Safari layers multiple hues to achieve an overall color with lots of authentic variation and striation. Also ask about end caps and other accessories that are also available to complete the project. Fire Protection: PVC carries an innate Class-A fire rating. 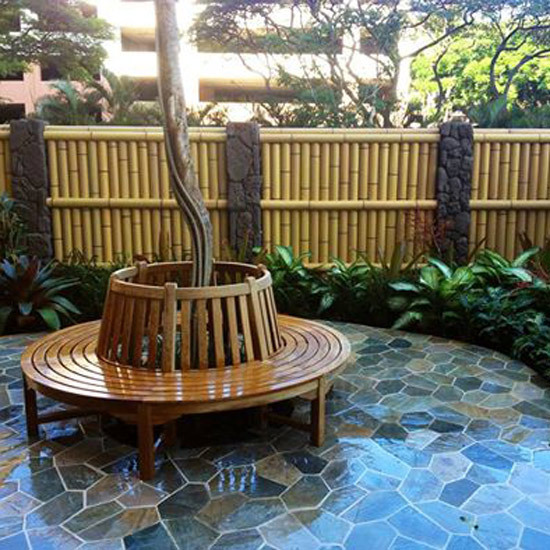 Durability: Significantly more durable than natural Bamboo in direct weather applications. For particularly high-traffic applications, inquire about extra protective top-coats. Size: diameters from 1″ to 12″ and sold in 20′ lengths. Can be cut to size. Ease of Installation: Installation method vary greatly depending on application. Most installations can be done by novice DIY’ers – talk with your sales rep with any questions. Color: Natural or Green are typical colors, but since we make this entirely in-house to order, custom options are easy. Materials: Standard schedule 40 pvc pipe, and high quality automotive paints and sealers.